Firebase needs a security system. In a traditional database you provide your own security using your API server. Since Firebase is the API server, it needs a programmable way to control read and write access to your data. When users use your client apps to authenticate with Firebase Authentication they receive a JSON Web Tokens that will identify them to Firebase's security rules system. We'll cover this more later. Just remember that Firebase Authentication will enable your users to interact with the rest of the Firebase platform. All of these methods use JSON Web Tokens, also known as JWTs. JWT is pronounced the same as the English word "jot". We'll cover JWTs later. Don't worry. They're simple JSON objects. Email/password auth is exactly what it sounds like. You register an email address and a password with Firebase and it keeps track of your user account. Google acquired Twitter Digits in early 2017 and rolled their phone authentication into Firebase Authentication. This means that with minimum fuss you can implement a full SMS-based phone auth flow. This is particularly great for mobile web apps. Phone authentication is the preferred auth method for many users, especially those outside of the United States. OAuth is the fastest auth method, because it relies on accounts that your users already have. Most everyone has either Google, Facebook or Twitter, and developers love Github. OAuth 2 is also the easiest auth flow to implement. And all of the OAuth providers support multi-factor authentication, which we should all be using. You may want to interact with a client that hasn't authenticated. If you're developing a shopping cart feature for your app, you may want users to add items to their carts before they've created an account. This is where anonymous auth comes in. Without some sort of authentication, there's no way for your server to know who it's talking to. Firebase's data is either entirely open or requires authentication. Any private transaction between the Firebase database and a client app requires authentication or it will be public and could be intercepted by a malicious third party. There are situations in which you might make your data publicly accessible; however, user transactions with your database are unlikely to fit this model... and that's where anonymous auth comes in. Would you like to use a third-party authentication system with Firebase? Maybe you'd like to authenticate with your company's existing SAML implementation? That's not a problem. We won't cover custom tokens here except to say that you can use your private auth servers to mint Firebase auth tokens that you can then send to your client applications. These tokens will allow your client apps to authenticate with Firebase using whatever JWT you create on your server. Linking multiple auth providers is another topic we won't cover here. Just be aware that you can easily link multiple auth providers to a single account. For example, your user might register an email/password account and you could prompt her to link her account to Google and Facebook. 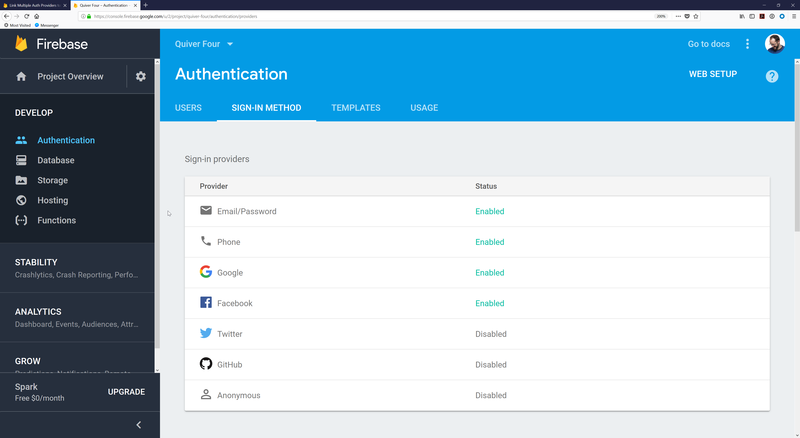 Your client app can make a couple of easy calls to Firebase Authentication to initiate the linking procedure, and now your user can sign in with Google, Facebook, Twitter or Github. Alternatively, if your user signed up with an OAuth account, you can prompt her to register a linked email/password combination.